NAHA, OKINAWA PREF. 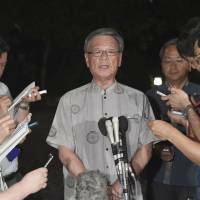 - Okinawa’s anti-base faction retained and slightly increased its majority in the prefectural assembly following Sunday’s election, representing a victory for Gov. Takeshi Onaga and a setback for Prime Minister Shinzo Abe and the ruling Liberal Democratic Party. Candidates who supported Onaga and ran in opposition to relocating the U.S. Marine base at Futenma, in central Okinawa Island, to the northern part of the island won 27 of the 48 assembly seats. Of the 21 remaining seats, 14 went to the LDP and four went to Komeito. The rest were taken by candidates who fundamentally oppose Onaga. Voter turnout was 53.31 percent, up 0.82 point from the previous prefectural assembly poll, in 2012. 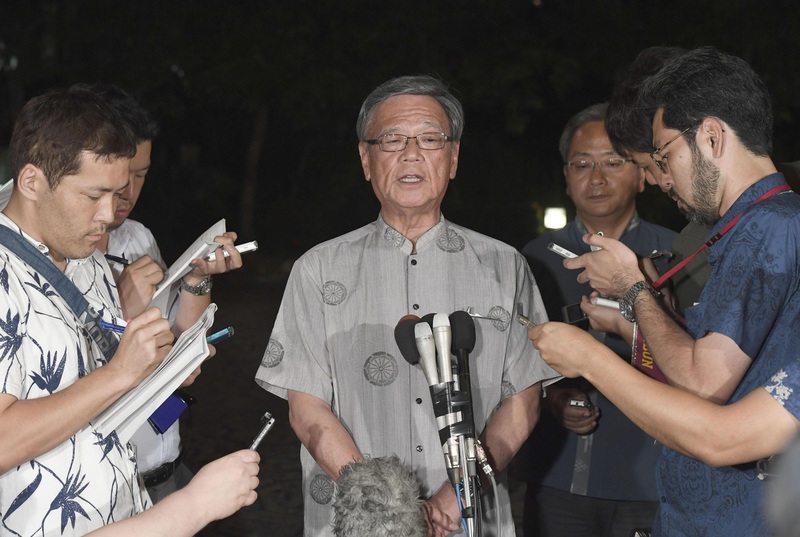 “The election showed that the people of Okinawa support efforts to stop the construction of a new base,” Onaga said at a press briefing early Monday morning. The poll outcome shows Okinawa’s support for Onaga, and it will represent a setback for Abe and the LDP, whose prefectural members are in the opposition. Officially, 71 candidates were vying for the assembly’s 48 seats, although two districts in Nago were uncontested. Before the assembly was dissolved, the LDP and national partner Komeito were in the minority. The majority support Okinawa Gov. Onaga, who took the prefecture’s helm after campaigning against the construction of a replacement facility in Nago’s Henoko district for U.S. Marine Corps Air Station Futenma, which sits in densely populated Ginowan. Of the 71 candidates, 37 were from a half dozen parties, including the Japanese Communist Party and the Social Democratic Party, that back Onaga. Another 12, including four from Komeito, four independents and three from Osaka Ishin no Kai, officially declared themselves “neutral,” positioning themselves between the Onaga supporters and the LDP. The LDP itself was backing 19 candidates, including three independents. Despite statements from Abe’s administration last week that the election results will have no impact on the Futenma relocation plan, the central government has made numerous efforts to quell Okinawan anger stemming from the murder of Rina Shimabukuro, 20, allegedly by a U.S. civilian worker at the Kadena Air Base. Subsequent promises by senior Abe administration officials to beef up security and take preventive action have largely failed to curb calls to revise the U.S.-Japan Status of Forces Agreement, even among local LDP members. A meeting in Singapore on Saturday between Defense Minister Gen Nakatani and U.S. Defense Secretary Ash Carter produced an agreement to review SOFA implementation practices related to U.S. personnel with SOFA status, including the civilian component. However, Okinawan media were quick to point out that it did not meet growing demands in the prefecture for a formal SOFA revision to give local officials, especially the police, more authority and autonomy when dealing with incidents involving U.S. military personnel, their dependents or civilian workers. With news Sunday that an American sailor attached to Kadena was arrested late Saturday evening after being involved in a drunken driving accident that injured two Japanese, central government officials once again found themselves forced to respond. The Foreign Ministry said Sunday afternoon that Foreign Minister Fumio Kishida had contacted U.S. Ambassador Caroline Kennedy over the incident, expressing deep regret that it occurred while Okinawa was still in mourning over the Shimabukuro slaying. Kennedy extended an apology and expressed concern over the two victims of the incident and said the U.S. will cooperate with the investigation. But Okinawan political resolve for officially revising SOFA is likely to grow stronger in the coming days, regardless of Sunday’s results or central government and U.S. statements.